Delilah Dawson is the author of many books, with her debut YA SERVANTS OF THE STORM having just released yesterday! 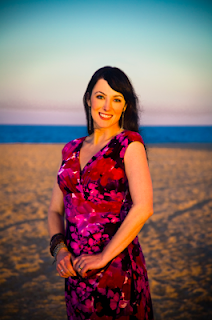 We are excited to have her on the blog today and to welcome her to the YA world! Confession: I didn't know I wanted to be a writer until I was 32 and hallucinating. In high school, I was in the most advanced English classes, writing poetry for the lit mag and zipping through ten-page papers. And yet I always felt as if writers, much like nuns and heart surgeons, knew early on what they were supposed to do with life and worked toward it with monastic obsession from the moment they could hold pencils. I thought writers had to be chosen by the muse, that there were special skills and knowledge necessary to write a book. Here are 10 things you absolutely do not need if you want to be a writer. You don't need anyone's permission, buy-in, belief, or verbal agreement to be a writer. You don't need an English teacher to fawn over you. You don't need writing awards. You don't need to be voted Most Likely to Succeed or Best Artist in the senior yearbook. You don't need to be the best writer in your school, or even in your Honors English class. You don't need for anyone to say, “Wow, you should be a writer!” You just need to write. Because writers write. They don't say they're going to write or sit around coffee shops with journals waiting for someone to ask them about writing. They just WRITE. You don't need a degree, an MFA, a muse's blessing, or a birthmark shaped like an ampersand to become a writer. The only thing you absolutely must have is tenacity. Other things that help include a thick skin, a passion for reading, a working understanding of language, and a love of coffee. I worried about my lack of credentials when querying, but they truly don't matter. Either an agent is hooked by your writing or they're not. Knowing you won a contest doesn't compel them to read on if they're bored. You don't have to live in New York, know a bestselling author, or have a best friend who grew up to become an agent or editor. You don't have to hobnob or go to parties or have an ongoing epistolary relationship with David Levithan. You can learn everything you need to know about getting published from the internet, most of it for free. I did. All those links are here: whimsydark.com So I guess you don't need publishing connections so much as you need a good internet connection. Contrary to popular belief, you don't need a souped-up Mac, a gleaming Ikea desk and ergonomic chair, and a dedicated office space filled with signed first editions. Writers writer. Period. Anywhere. Any way they can. Don't let your writing or your writing conditions get precious. Find ways to take your work with you; for example, I use playlists to immerse myself in each book, such that whenever I hear that playlist, I'm in that world. All I need to dive back into writing is a pair of noise-canceling earbuds and my laptop, a well-loved, reconditioned MacBook Air I bought on major sale that's had its E, S, D, C, A, and N rubbed off the keyboard. When I first started writing, I thought it was all about the idea, that you had to imagine a character no one had ever read before in a mind-blowing world following an amazeballs plot. And, yeah, that would be great, but it's the execution that's important. You could give 100 writers the same opening line or main character or hook, and they would each write something utterly different in a style all their own. What makes an idea special is how you develop it using your voice and experiences to sweep the reader away from their everyday world. Most of the books that go viral, that really capture the public's attention, are very familiar... with a small twist. A misunderstood boy... GOES TO WIZARD SCHOOL! Vampires... IN HIGH SCHOOL! THAT SPARKLE! Teens in love... WITH CANCER! Teens fight demons... USING THE POWER OF TATTOOS! And, yes, these books earned our love through well-rounded characters, realistic dialog, and twisty plots, not just because of their hooks. Like I said at the beginning, I didn't write my first book until I was 32... and hallucinating. When my second child was 9 months old, he stopped sleeping, which meant I only got 3 hours of sleep a night. And my brain... sort of broke. I was manic, weepy, messed up, and imagining talking rats in the walls. And the part of my brain that had always said YOU CAN'T WRITE A BOOK, ONLY SPECIAL PEOPLE CAN WRITE BOOKS... that part broke. Nothing told me no. Nothing held me back. And it was pretty crazy, but it was freeing. I wrote my first book in about a month and a half. And that book was fatally flawed, but I took it through the editing process and queried it, and what I learned through that experience taught me what I needed to know to write a better book and write a better query and land an agent. The sad truth is that many writers and artists deal with mental health issues. I have battled depression, and I survived suicide in my teens, and I have to keep careful watch of when I start to dwell in dark places. But that doesn't mean I can't write. In fact, writing helps keep me evenly balanced because writing means always looking ahead instead of dwelling on the past or what's wrong in the present. I want to finish the next chapter. I want to finish this book. I want to write the next idea. No time is perfect. No person is perfect. No book is perfect. But there is nothing that can stop you from dreaming and writing. You just have to ignore fear of failure and get out of your own way. It's a sad fact that there are people who won't believe in you. Maybe it's your parents, your best friend, your teachers. When I became a writer, I lost friends. Mostly because we had very little in common and drifted apart. Some people don't like to be left behind. They don't like to be reminded that you have a quest and a dream and they, perhaps, do not. They don't like to watch you succeed if they are not succeeding. And many people don't feel that being a writer is a worthy cause, such that it doesn't make much money or give you great insurance, which is what a certain kind of unimaginative adult really values above all else. And I know writers who lost spouses when they realized that they couldn't spend their life with someone who didn't support their dreams. I'm not saying that being a writer means becoming a lonely, misunderstood hermit. And I'm definitely not telling you to drop your friends or block your parents. What I am saying is that you only get one life and should never let anyone disparage your dreams. Writing can feel very solitary, and you need a community, but you deserve to be lifted up, not squashed. And when you feel down or alone, reach out to other writers via social media. 7. TO BE A STARVING ARTIST. One of my biggest recommendations for new writers is to keep that day job. Keep your insurance, keep your steady paycheck, keep your 401K, keep that scholarship. Writing doesn't pay very well, and when it does, you can't count on when checks will arrive. It's hard to focus on your craft when you're hungry and staying awake all night, worried about paying rent. I also believe that when you're starting out, it's helpful for writing to be your escape, your hobby. That way, you look forward to it while working your regular job and dreaming about your scenes, and when you get home, you're super excited to write. Make it a treat. If you have nothing else going on in your life except writing, then writing becomes a chore and a task and something to dread. That's when people tend to get Writer's Block: when they sit at the keyboard and think, OMG, I MUST DO THIS THIS IS THE ONLY THING THIS OR FAILURE. >et writing be your dessert... after a great meal you bought using your paycheck at a boring day job. 8. TO FIT THE RIGHT PROFILE. There's this stigma that white dudes get all the book contracts, but that's changing. And that's also why querying and the slush pile help level the field: an agent reading your query can't see your face. They can't tell how old you are, if you're male or female, if you have disabilities, what your dating history is, how popular you were in school. They only see your writing, and if they like that, nothing else really matters. Of course, if they like you, they're going to Google your name, so make sure that you give good Google. You are always welcome to write under initials or a pseudonym, although it's expected that you're honest with a prospective agent about who you actually are; plus, they'll need your real name for contacts and checks. And if you want to self-publish? You get to be whoever you want to be. Make up a new name, a new online persona. You're the person in charge of your writing and how you wish to be perceived. Everybody has advice, right? But every writer's process is different, and every book's process is different. You don't have to take every piece of advice you read from a respected or successful author. You don't have to outline, or freewrite, or write in longhand, or do character profiles. You don't have to retype famous books. Read lots of advice, consider the source, try new things, and find what works for you, what helps you take your writing to the next level. If something doesn't work, drop it--without guilt. Every journey is different. Let me tell you a secret: All writers are liars. We're storytellers. We spend our days making up stories and playing around with ideas. So even if you see very serious people in turtlenecks holding Cocker spaniels on book jackets, you don't have to be serious and stuffy to be a respected writer. Being a writer is a great way to never grow up, to never accept that you must get old and boring. You can be weird, fun, geeky, silly. You can dye your hair odd colors and get book-inspired tattoos and go to bars in crazy shoes and giggle. You have to be professional, but that means you do good work and hit your deadlines. It doesn't mean you have to be boring. OMG, this interview is SO AMAZING!! I've suffered through a lot of the same darkness in my own life and never thought I was special enough or good enough to pursue my dream of writing. But in 2009, with a failed abusive marriage behind me, I just started writing. There are times when I swear I'll never be good enough or wonderful enough to be published, but then there are times when I know what I'm writing is good. I thank you for this post, it has touched my heart and proven what I've been trying to tell myself for a long time. Terrific interview. Great points for us to remember. 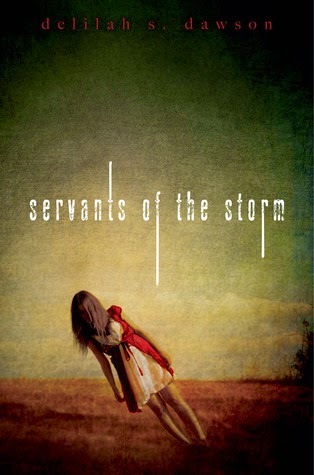 I LOVE the cover of Servants of the Storm and really want to read it, although I suspect it will scare the socks off me! Thanks for the post. Good points. Also, as a writer, it may be worth knowing that you may need an editor, "Writers writer. Period. Anywhere." Which hallucinogen do you recommend for this catharsis? I appear to be at the right age.